This is a post I had hoped to avoid making. There will be a farewell for Sheikh Mansour Leghaei, his wife Marziah, and his daugther Fatima, on Saturday June 26 at 8pm. The gathering will take place at the Imam Husain Islamic Centre (6 Lang Road, Earlwood). It will not include dinner as the team felt that numbers would be impossible to estimate and probably impossible to cater for. Everyone is invited. It will be a painful time in so many ways, and yet we intend to close this chapter of our campaign with dignity and thankfulness, believing that the battle for Mansour’s fundamental human rights can yet be won, and that our relationship with him is by no means over, even if, for a time, he will not be with us in person. ”It makes me sick to the stomach.” The quote is from me (Father Dave), as reported in Rick Fenley’s June 22nd article in the Sydney Morning Herald, “Time running out for sheikh told to leave“. 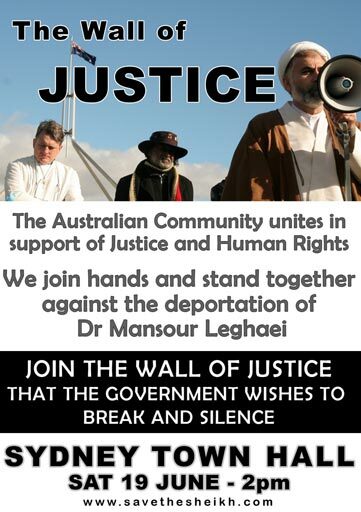 The quote is with reference to the way the Australian government persuaded the United Nations to withdraw their request for a stay on the deportation of Sheikh Mansour Leghaei, on the basis that they are not actually breaking up his family. The government claimed that because they had given visas to Mansour’s wife and youngest son that they were therefore not damaging the family unit. Hoever, in reality, the Sheikh and his wife and daughter will be forced to head back to Iran with Mansour, thus leaving three sons in Australia and breaking the family in half. As the article also makes clear though, the United Nations is still pursuing the Australian government over concerns that Australia has violated fundamental human rights treaties to which it is signatory in the way it has treated Sheikh Mansour (eg. the right of every person to a fair trial). The government has been given until October 21st to respond to the United Nations’ concerns. Read the full article here. Another major media outlet to cover the Sheikh’s story is Al-Jazeera. As well as the clip displayed below, Al-Jazeera is considering a full-length documentary concerning the Sheikh’s treatment. Download the PDF version of the promotional poster here. Email it to your friends, print copies, post them up in your school, university, church, mosque or workplace, and take your stand for justice!